The Whirlpool Stainless Steel Microwave/Hood Combination (Model #GH6177XP): Grill steaks and bake brownies with real oven results using the g2Max technology in this SpeedCook oven. Grill steaks, brown chicken, even bake brownies with the Whirlpool g2microven Speedcook Appliance. It combines the speed of a microwave with the results of an oven – without compromising taste or texture. Welcome to the new era of cooking! 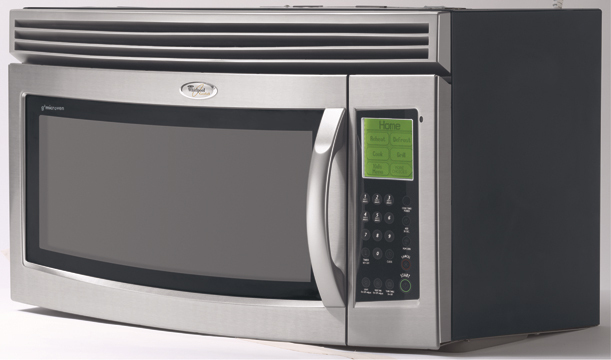 Whirlpool Brand’s g2microven Speedcook Appliance combines the speed of a microwave with the results of an oven. Grilled meat looks and tastes like it was grilled under the oven broiler. Bake items you once thought could only go in the oven and get delicious results at microwave speed. A unique combination of halogen and quartz light energy provides 1,500 Grill Watts to grill, brown and bake food for real oven taste and texture. 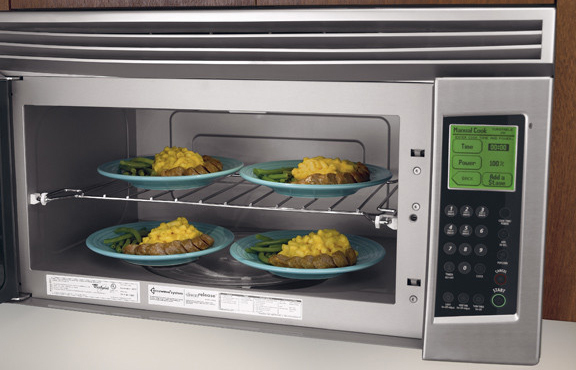 The AccuWave Power system delivers precise cooking power to provide consistent results whether you need even gentle heat to soften butter, or robust power to swiftly cook fanily meals. Constant, gentle heat evenly cooks, defrosts, reheats, softens and melts. Thaw chicken without cooking the edges and reheat sauce without splatters to clean. Set yourself free from spills, splatters and over boiling when simmering sauces, soups and rice. The Simmer Cook cycle uses its built-in sensor system to quickly bring liquid temperatures to a boil, then quickly reduces the oven’s power to a delicate simmer. No cleanup, delicious results. g2Max Speedcook (combination of quartz & halogen light for grilling, browning and baking). Microwave Oven Capacity 1.7 cu. ft.